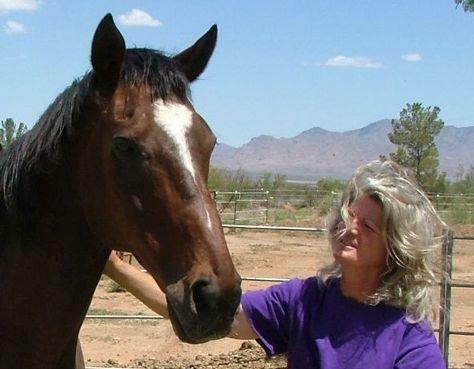 Located in a rural area two and a half hours from Tucson, Arizona, Harmony and Hope is a 40-acre ranch that is a permanent home to 32 Thoroughbreds and 18 other breeds of horses. Interestingly, Harmony and Hope is one of very few rescue organizations that accepts stallions. “I really enjoy the stallions,” said Plenty. “They like to test you but I let them know that I’m head mare around here.” The ranch is currently home to eight older stallions including sons of Grindstone, War Chant, Sea Hero, Pirate’s Bounty, Air Forbes Won and two sons of Hennessy. Harmony and Hope does not utilize any paid employees and, due to its remote location, does not have a large volunteer base so much of the day-to-day horse care is managed by Plenty. A typical day at the ranch begins at 6 a.m. with wellness checks of all residents followed by morning hay and grain. Plenty completes farm chores then offers lunch time meals for horses with special nutritional needs. Afternoons are often dedicated to grooming and hand walking before the afternoon feedings. Evenings are often spent catching up on paperwork or writing grant requests.